Posted on May 8, 2017 September 25, 2017 AuthorMark McLaughlin M.D. I am attending today’s Wedemeyer lecture at West Point. 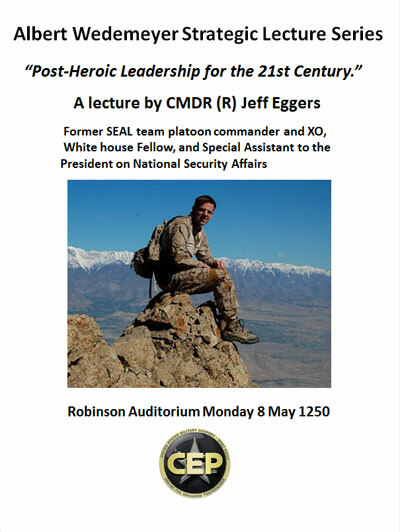 I’m fascinated to hear CMDR Eggers presentation. The General Albert C. Wedemeyer Strategic Lecture Series Endowment is a part of West Point’s Center for Enhanced Performance. This endowment honors the intellectual and strategic legacy of General Wedemeyer through a series of lectures, think tanks, or roundtable discussions for cadets and faculty. Visitors to this website may be aware of the book “General Albert C. Wedemeyer: America’s Unsung Strategist in World War II” written by my father Dr. John J. McLaughlin. ← Previous Previous post: From Do No Harm to Do Harm: A Neurosurgeon’s Path to Madness?